Notable for its lively, colloquial prose, Sid Fleischman's new biography, THE TROUBLE BEGINS AT 8 : A LIFE OF MARK TWAIN IN THE WILD, WILD WEST, is filled with stories of get-rich-quick schemes devised by Samuel Clemens. Such endeavors included trading coca, mining silver, and harvesting timber. Even his public lectures (whose advertising catchphrase -- "Doors open at 7. The trouble begins at 8" -- provides the book's title) were initially viewed as just another money-making opportunity. Mr. Fleischman's book focuses primarily on Twain's early adventures, then hurriedly giddyups through his later literary triumphs. Interestingly, even after he became a famous writer -- famous enough to be pictured in the deck of "Authors" playing cards -- he never quit looking for ways to make a quick buck. In 1885, the same year he published THE ADVENTURES OF HUCKLEBERRY FINN, Samuel Clemens received his third patent from the United States Patent Office. The first, in 1871, was for an "Improvement in Adjustable and Detachable Straps for Garments" -- an item that was apparently never manufactured. His second patent was for an "Improvement in Scrapbooks." Produced for twenty years, Twain advertised these books (available in many different sizes and styles) with the words: "I have invented and patented a new Scrap Book, not to make money of it, but to economize the profanity of this country. You know that when the average man wants to put something in his scrap book he can't find his paste -- then he swears; or if he finds it, it is dried so hard that it is only fit to eat -- then he swears; if he uses mucilage it mingles with the ink, and next year he can't read his scrap -- the result is barrels and barrels of profanity. This can all be saved and devoted to other irritating things, where it will do more real and lasting good, simply by substituting my self-pasting Scrap Book for the old-fashioned one." 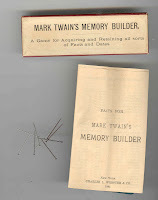 According to Milton Meltzer's 1960 book MARK TWAIN HIMSELF, the memory-builder was "developed originally as an open-air game to teach his children history and dates painlessly." The padded gameboard, 13 x 9 inches, came with a box of silver and black pins which the opposing players used as markers. 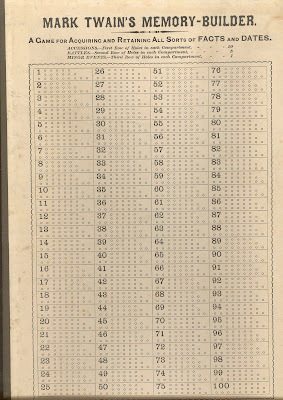 The front of the board contained space for one hundred answers in the categories of Accessions (i.e. president elected to office or royalty assuming throne), Battles, and Minor Events. According to the lengthy instructions: "The board represents any century. Also, it represents all centuries. You may choose a particular century and confine your game to one nation's history for that period; Or you may include the contemporaneous history of all nations." 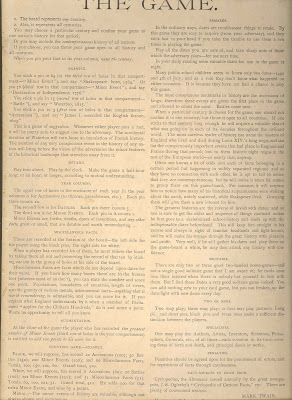 Twain, who wrote the instructions in first person, provided some examples of game play: You stick a pin in 64...and say, "Shakespeare born, 1564. Or pin 76...and say, "Declaration of Independence, 1776. You stick a pin in 15...and say, "Waterloo, 1815." You stick a pin in 3...and say, "James I. ascended the English throne, 1603." In addition to the convoluted rules, the game also presumed a pretty high level of historical expertise! According to Milton Meltzer, when Clemens conceived the idea he "couldn't sleep as his mind projected the game into a vast scheme that would sweep millions into his pockets. By the time fantasy stopped, the game looked like a cross between an income tax form and a table of logarithms." Needless to say, "Mark Twain's Memory Builder" did not sweep millions into the author's pockets. In fact, the copy I found in the library, complete with a helpful "fact book" (which includes dates of the English monarchy) and pins, has never been played. Not a single circle on the gameboard has been punctured by a pin! E I G H T !